The title of this book alone catches my attention. 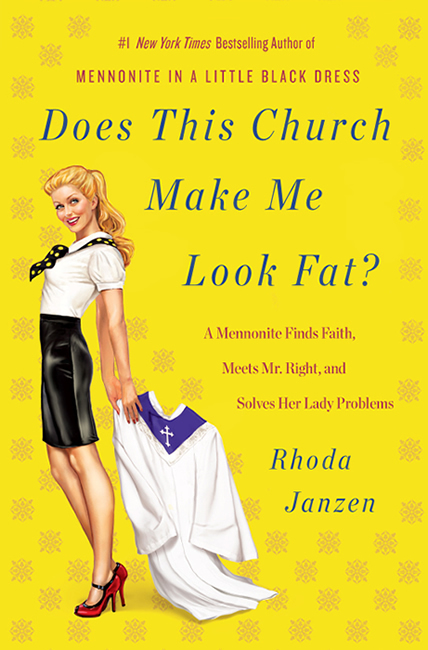 The author, Rhoda Janzen, returns to church in her adult life, after not being an active church goer since she was 12. She is dating a man who is an very active Church goer, so she begins to attend church with him. She finds herself going through a journey of faith and love. The book is really good!!! Read it, give it as a gift to your girlfriend, sister, or anyone! The church she is attending is not the Mennonite church she was raised in, but a Pentecostal church. If you are feeling distant from an organized church setting, this book might be a really good read for you. It's her story of love, faith, finding strength in her illness, and faith in God. This book is about life as we know it: family, love, marriage, illness, and faith. You can get a copy from the author over at her web site-look for locations where the book is sold near the bottom of the page. closed,GIVEAWAY: Leave a comment on this post for your chance to win a copy of DOES THIS CHURCH MAKE ME LOOK FAT. Winner will be chosen by random.org. Winner needs to have a valid USA mailing address. Please leave your email in your comment or google profile for contacting you if your comment is the random winner. Giveaway closes November 2, 2012 at 12 midnight EST. Disclosure: I received a copy of this book to read for this post. The comments and views are my own. Now this sounds like a really fun book! I'd love to win a copy. Thanks for doing this review and hosting a giveaway! congratulations Linda: your comment was the random.org winner! Awesome, thank you Alison! I can't wait to read this book. Love the title! I would love to win! LOVE THE TITLE!!!! Sounds like a funny book!